Whether Ariel Sharon returns to his post of Israeli prime minister is not known but what is known is that, as things stand, he has left a legacy but has not left a peace settlement. His political legacy is the withdrawal from Gaza and from parts of the West Bank. In historical terms, this was a major switch by the man and by the country. Ariel Sharon had previously championed the settlement movement and had stood with those who believed that Israel's security depended on possession of all the land between the sea and the River Jordan. The withdrawal marked the end of all that and yet does not automatically lead to the kind of lasting agreement that the peoples on both sides yearn for. It has still left open the issues of where Israel's final borders should be and what form of Palestine there should be. At this moment, the gap between the Israelis and Palestinians remains so wide that a settlement is hard to envisage. 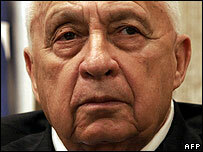 How much, if any, of Jerusalem would the Sharon camp be willing to give up, for example, in final negotiations? Without a concession on Jerusalem, would the Palestinians settle? One doubts it. One suspects that the old general knew this as well as anyone and prepared for it by constructing the barrier (part fence, part wall) separating Israel from the main Palestinian areas. The barrier could become part of his legacy as well. Things said to be temporary in the region often turn out to have a long life. Facts on the ground, they call them. So if there is no progress, the history books might also say that Ariel Sharon was simply circling the wagons to make Israel easier to defend. He has pencilled in the borders perhaps. And yet there was a sense, I think, that it all went further than the tactics of an old campaigner. He did come to accept that the solution did not lie simply in conquest and occupation. He had tried that all his life, mostly in war, in which he excelled as the man with the masterstroke - the sudden daring move that upset the battlefield, as during the 1973 war when he struck across the Suez Canal. Not that the tactic always worked. His drive to Beirut in 1982 under the guise of advancing his reconnaissance was politically disastrous and led to his downfall, temporary though it was. One has to wonder, though, whether he really had a vision for a final settlement. Having given up his old views, he was not ready to go to the other extreme and accept that the 1967 borders had to be the basis for an agreement. He has left the issue somewhere in the middle. And, if it remains like that, the current state of play - no war, no peace - appears set to continue indefinitely. There would need to be another major shift, on either side, to get back to that largely forgotten road map to peace. For many Palestinians, of course, the Sharon legacy will be more bitter. They remember his role as commander of Unit 101 which raided into the West Bank in the 1950s. They remember his role as the defence minister who allowed the Phalange into the refugee camps of Sabra and Shatila in 1982 and who was forced to resign after those massacres after being criticised by the Kahan Commission. They remember the government minister who piled settlers and buildings into the West Bank. 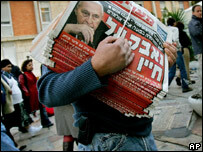 Ariel Sharon will be compared to Menachem Begin, another warrior turned statesman, who gave up the Sinai and made peace with Egypt. That was a huge plus for Israel and one that did more to guarantee its future than almost any other. But even Begin himself did not bring peace with the Palestinians. Indeed that issue was virtually sidelined in the agreements with Egypt and left to the uncertain future we have seen unfold. Mr Sharon has not been able to bring it to a conclusion.